This chocolate cake is eggless and can be prepared in just 2 mins. This cake is so moist and each bite gives you a rich chocolaty flovour. I had gotthis recipe from my blogger friend Meena of Homely food. 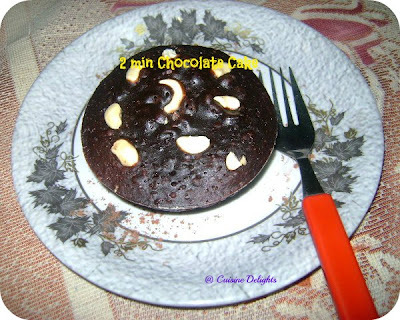 I made this cake in microwave but who doesn't have it can steam slow cooker using stove top. Take a bowl mix all the dry ingredients. 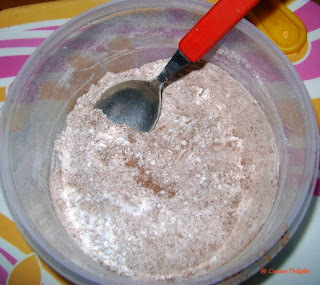 Flour, cocoa powder, baking powder and salt, mix it. 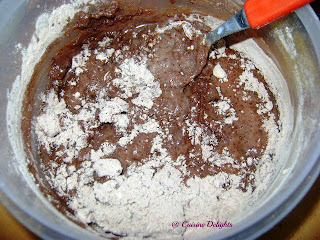 Take an another bowl mix all wet ingredients. 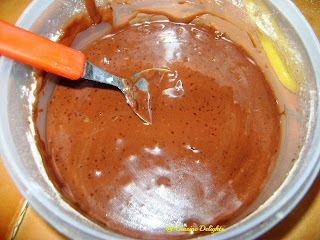 Milk, vanilla essence, oil and sugar, mix with a spoon. Make it a runny batter and sure there were no lumps. Sprinkle few cashew on top. Put the bowl in microwave on full powder and cook for 2 mins by checking in between after 1 min. It should not be in convection mode. 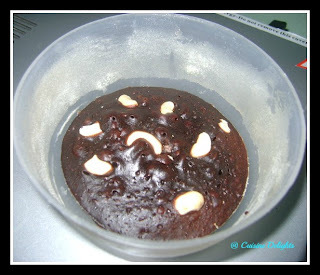 After 2 mins check if the cake is ready by inserting toothpick. If needed bake it for 1 min. Stopped the oven and leave the cake for few minutes.